We’ve Entered the UK Blog Awards 2014! We’ve entered the UK Blog Awards 2014. You can vote for us here. 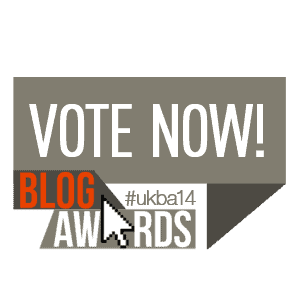 It’s quick and easy to vote for us, and in return, you’ll receive a free blogging ebook from the UK Blog Awards folk, which is rather nice. Where the Wild Things Are was originally titled ‘Where the Wild Horses Are’, but Maurice Sendak changed his mind as he couldn’t draw horses. Harper Lee’s friend gave her a year’s wages for Christmas, on condition that she give up work and write. She wrote To Kill a Mockingbird. Dickens’s house at Gad’s Hill reportedly had a secret door in the form of a fake bookcase. The fake books included titles such as ‘The Life of a Cat’ in 9 volumes. Emily Bronte’s dog, Keeper, followed her coffin to the grave when she died and, for weeks after, moaned and howled outside her bedroom door. Edgar Allan Poe coined the word ‘tintinnabulation’ to describe the sound made by the ringing of bells. An Italian translation of George Orwell’s Nineteen Eighty-Four has the clocks striking ‘uno’ instead of thirteen because ‘Italian clocks don’t go up to thirteen’ (missing the joke somewhat). In one of Jane Austen’s first stories, ‘The Beautiful Cassandra’, the heroine (based on Jane’s sister) shoplifts a hat and punches a cook. The Latin translation of Winnie-the-Pooh, entitled Winnie ille Pu, is the only Latin book to have made the New York Times Bestseller List. Before finding fame as a novelist, Dan Brown was a pop singer. One of his solo albums was called Angels and Demons. The memorial plaque to Emily Dickinson in Amherst, Massachusetts, composed by the poet herself, features just two words: ‘called back’. If you enjoyed any of those literary factoids, we’d greatly appreciate it if you could take a few moments to vote for us so we stand a chance of winning in the Arts and Culture section of the blog awards. To vote for us, simply click on this link to take you to our page on the UK Blog Awards website. And thank you! It was my pleasure to vote for you :) Good luck! Anyway good luck you have a great blog. Cheers for this, Steve – I hadn’t considered multiple voting, but now you mention it I suppose that might be an issue. Hmm. Will have to do some research and see what I can find out! Thank you for voting! My pleasure to vote for you. By the way, I’ve never been to Dickens’ Gads Hill house, but Edward Bulwer-Lytton’s Knebworth Hall has a secret passage behind a book case as well. Thank you so much! Ah, I didn’t know Knebworth had a secret passage, though I have seen the house on TV programmes and wondered. Will have to try to visit some day! It’s definitely worth a visit. A wonderful house. You got a well deserved vote from me. Good Luck! Glad to vote for you, Brenton. I really enjoy your blog. Thanks, Stephen! Really appreciate it. Reblogged this on One reader – A thousand lives. Just signed in by the way and voted, congratulations! You people certainly deserve it. Thank you, Karen, you’re a star! Thanks very much for voting for us – greatly appreciated!